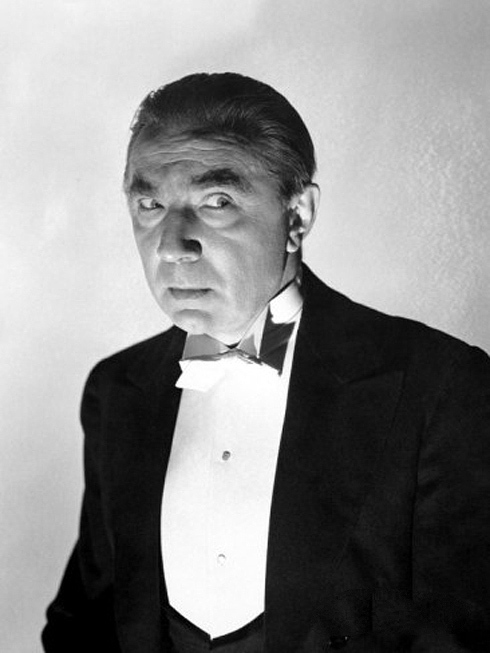 With 1942’s Night Monster, Universal created a superb example of the quintessential haunted house movie, and even threw in Bela Lugosi for good measure. 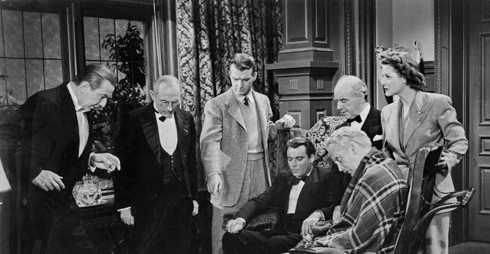 Intelligently directed by Ford Beebe with his usual flair, the movie exudes atmosphere, mystery and suspense, with some great set pieces designed by art director Jack Otterson and dressed by Russell Gausman. 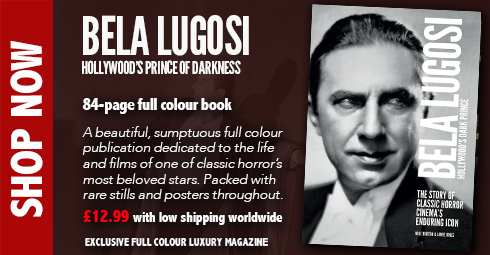 Wasted as ever so slightly sinister butler Rolf, Lugosi still manages to invest the picture with some extra gravitas, lilting and leering in his usual thick Hungarian. 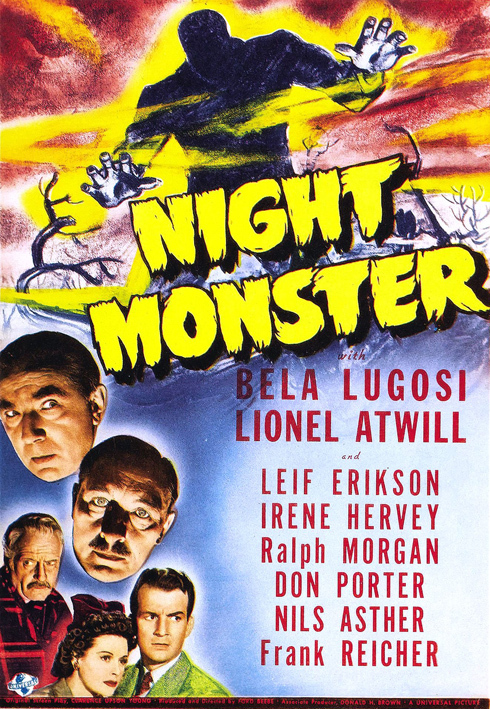 Night Monster was the star’s penultimate picture for Universal, and ironically, the second and last time he received top billing despite the fact that his role amounts to nothing more than a mere foil. We don’t even get to know if he survives the fiery blaze of an ending. Fantastic support is provided by Lionel Atwill as the fiendishly skittish Dr King, but again the studio did so little with him, it’s no wonder Night Monster continually rankles with both Lugosi and Atwill fans. 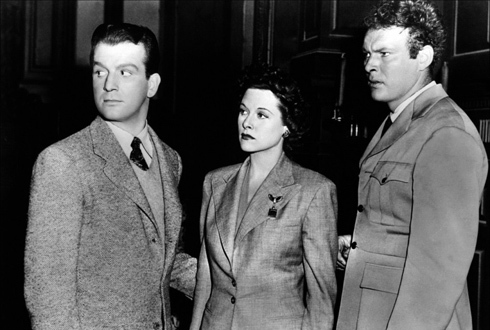 Why the powers that be at Universal in the 1940s could not make a deal more of two of their most competent performers is best guessed at; no amount of logic could ever reason that one out. Fay Helm as overwrought Margaret Ingston and Nils Asther as experimentalist yogi Angor Singh add sparkle, while romantic leads Don Porter and Irene Hervey give nice, rounded performances, with Ralph Morgan, as twisted, deformed Kurt Ingston, beautifully milking the innocent cripple routine within an inch of its life. 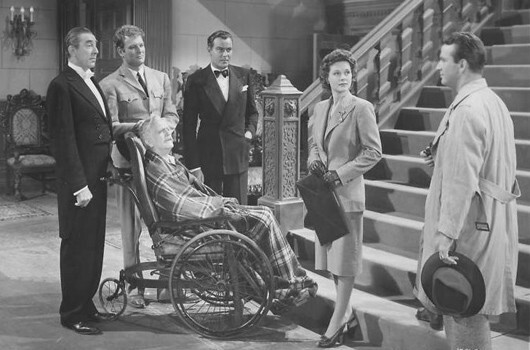 Doris Lloyd as sour and frumpy housekeeper Sarah Judd is a delight, as is Leif Erickson as boorish chauffeur Laurie. Unfortunately, it comes as something of a let down that the horrid, twisted fiend of Pollard Slough turns out to be nothing more than Morgan with raised eyebrows and Wolf Man feet, but the suspense leading up to the revelation is tautly directed and steadily paced by the actors. Ingston’s motive for murder with his rematerialised limbs is apparently to get even with the three doctors who let him down, which seems odd considering they seem to have done their level best for him, and also because the murders in Night Monster begin before their arrival. But this is Universal in the 1940s, so we know not to make a fuss; logical plots and continuity were increasingly not their strong points. 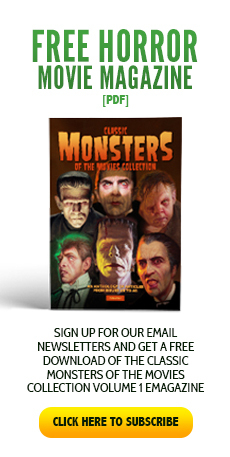 All in all, Night Monster’s assets vastly outweigh its failings, and we are left with a nicely made, creepy whodunnit monster film which elevates itself high above its ‘B’ movie status. 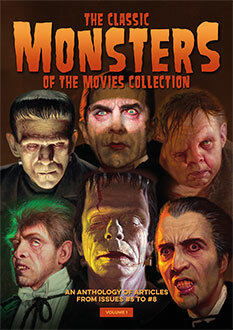 It is well worth tracking down for a contemporary viewing after all these years.